Peaceful, rural retreats. Each lodge offers high quality accomodation in an idyllic setting on part of our farm with plenty of wildlife, fishing our lake, and farm walks available for your enjoyment. An ideal base for relaxing and exploring all the wonderful attractions and countryside Lincolnshire has to offer. Little Owl Lodge, Badger Lodge and Swan Lodge have a lovely relaxing hot tub. The south west rural corner of England extends into the Atlantic. The large waves on Cornwall's Atlantic coast and in north Devon attract surfers in their droves. The sight of people of all ages clambering onto surf boards and attempting to remain upright as they catch a wave is fascinating. More often than not they fall off and begin the challenge all over again. St. Agnes, Perranporth, Newquay and various beaches up to Polzeath and Rock are favourites with surfers. Surf schools, surf board hire and shops can be found on most of these beaches. The West Country coasts that extend into the English Channel are more sheltered and calm. These are good for relaxed lazy family seaside holidays. Sennen Cove near Land's End is a fabulous clean white sand beach. St. Ives offers 3 enormous sandy beaches and there are many others. Porthkidney beach near St. Ives allows dogs all year round. 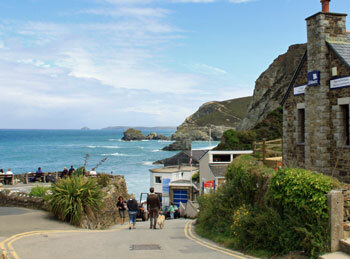 Cornwall, Devon, Somerset and Dorset are all excellent locations for beach holidays. Rent a holiday cottage on the coast to reduce travelling time and distance. If at all possible, find a cottage within walking distance of a beach because parking can be difficult on the West Country coast and do you really want to travel long distances in summer heat with a dog? It is the stunning farmland and rural areas of the West Country that attracts thousands of holidaymakers. Areas of outstanding beauty rich in wild flowers and wildlife abound. Dartmoor and Exmoor offer expanses of natural countryside for walking under wide skies without hordes of tourists. And yet, surrounding these wild open spaces are villages with friendly pubs where one may drop in for a meal or a drink and interesting independent shops that a real treasure trove. Many establishments cater for dogs and their owners since the West Country is riddled with tiny lanes and trails. Find that perfect rural pet-friendly cottage in Devon, Cornwall, Somerset or Dorset and have a fantastic rural break.